Geospatial data files aren’t necessarily free, in fact, a lot of service providers charge a handsome amount of money for them (after all, the generation of these files takes time, effort and money). So before we start creating maps with R we have to address one other question first: Where can we get Shapefiles for free? Chances are that the zip folder you downloaded will contain other supporting files such as .prj or .sbn. For more info on these, head over to Wikipedia. 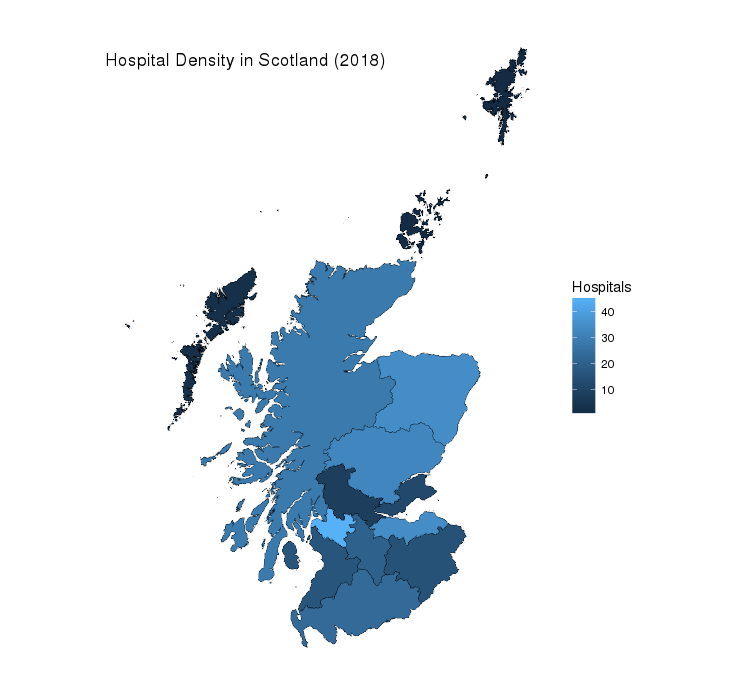 In this tutorial I am using the NHS Scotland Health Board Shapefiles distributed under Open Government Licence. The readOGR function from the rgdal package takes two arguments, dsn= (data source name) which is the folder/directory where the Shapefiles are located, e.g. ~\Projects\Shapefiles-in-R\data, and layer which is the name of the shapefile without the .shp extension, so in our case SG_NHS_HealthBoards_2018. Notice that we have 5 “slots” stored in NHSBoards object, namely @data, @polygons, @plotOrder, @bbox and proj4string. These slots can be accessed using @ and the first two are the main interest here. You can think of the @data slot as a table that stores attribute data pertaining to the geographic area of interest. As the name suggests, the @polygons slot contains the actual polygons (or lines in some instances - @lines) that are used by R to draw the map. In order to get the most out of ggplot’s map drawing capabilities it is best to get NHSBoards into tidy format using the tidy() function of the broom package. Please note: Calling tidy() on NHSBoards will remove the @data attributes. Luckily, we can add @data again with a simple left_join as shown later. Although our map looks very neat, there isn’t an awful lot of information to take from it. Let’s change this by adding @data back to our NHSBoards_tidy object. Let’s also add an additional bit of information, i.e. the number of NHS hospitals within each Health Board according to this ISD Scotland source. The map we have now conveys already quite a bit of information. However, seeing that the variable Hospitals is continuous and as a result of that the colour scheme is continuous also, I think it would be nice to add labels to the map showing the actual number of hospitals in each Health Board. Not too bad for a first shot, however, there are a couple of things wrong here. As you can see the islands don’t seem to have a label as the approximation of the geometric centre in the previous step wasn’t good enough (mean(range())). In fact, the positioning of some of the labels seems to be a bit off for some Health Boards so we will adjust these manually and set the colour for the island labels to black. The code shown in this post is probably not perfect so have a play about with it and let me know if anything can be improved. 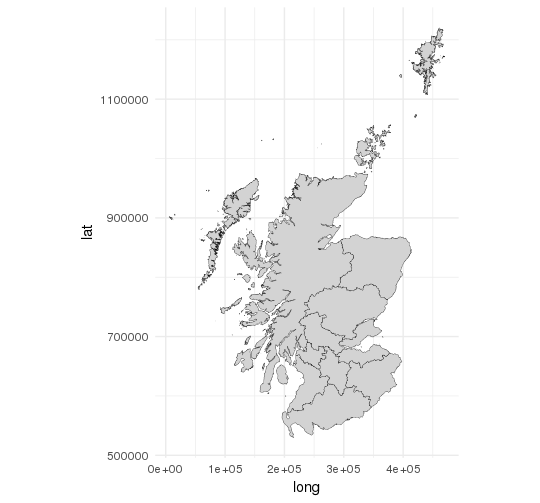 Most of the things I have learnt about visualising spatial data come from Robinlovelace’s Introduction to Visualising Spatial Data in R. My post is a somewhat distilled and ggplot2-focussed version in the spirit of Robinlovelace’s tutorial. If you have a little more time I would highly recommend to click on the above link.